Unlike many ski resorts around the U.S., Tahoe ski resorts will be staying open late this season. Thanks to some incredible February snow totals and more storms that continued into March and early April, Tahoe ski resorts have enjoyed an incredible amount of snow for the 2018-19 season, the most of any ski region in North America. Annually the latest Tahoe ski resort to remain open, Squaw Valley will have that distinction again this season and also has the most snow with 675 inches as of April 7. There are at least two weeks remaining for all 14 Tahoe ski resorts, so skiing and snowboarding Lake Tahoe will continue with terrific spring conditions. Seven of the 14 resorts will conclude the season on Easter Sunday, April 21. Five Tahoe ski resorts will stay open, the latest being Squaw Valley through July 7. Both Alpine Meadows and Heavenly Mountain will remain open weekends in May. Annually the latest Tahoe ski resort to remain open, Squaw Valley will have that distinction again this season and also has the most snow with 675 inches as of April 7. 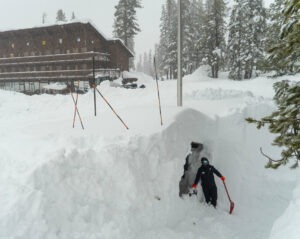 Amazingly, Squaw Valley had 300 inches of snow in February and exceeded the 600 mark by early March. “Squaw Valley has 50-plus feet of snow so far this season, it’s a benchmark for us,” said Squaw Valley spokesperson Alex Spychalsky in early March. Two other Tahoe ski resorts have received more than 600 inches, while six resorts have received 500 or more inches. Joining Squaw Valley in the 600-inch club are Sugar Bowl (618) and Homewood Mountain (606). More snow is expected this week, which should put Northstar California (596) in the 600-inch club. Sugar Bowl has the second most snow this season among Tahoe ski resorts with 618 inches. Northstar will be closing April 21, but two other Vail Resorts in Lake Tahoe will remain open. Heavenly Mountain will have close April 28, but the season goes through May 27 with the addition of four bonus weekends in May. This is believed to be Heavenly latest closing date in resort history. Kirkwood Mountain will conclude with a bonus 3-day-weekend – April 19-21.